We can expect to see the next version of the Android operating system officially released at some point before the end of this month at least for Nexus owners, and today we have an Android 4.4 KitKat Google Play Games design that is nice. Not an over lot is currently known about the Android 4.4 update, and it seems as if the new firmware is going to just be a minor refresh of the operating system. The image you can see on this page is one of many by Nikolai Prettner, which is his vision of what a new gaming service could be like if it was integrated into the new Android OS. This design for Google Play Games offers a more playful look while being more intricate with a flatter interface and a whole host of new features for the Android gamer. The designer doesn’t feel that the current Google Play Games doesn’t have enough for the serious gamer. 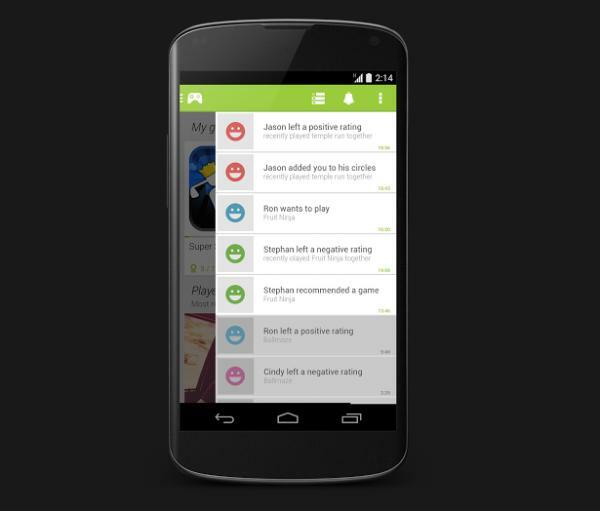 He mentions that he has to go into the Google Play Store to view leaderboards or to see game recommendations, but this design has a user profile summary that has a side column for viewing a profile picture, game achievements, number of games that a user plays, and how other users have rated you. This concept is working on the idea of having two side drawers with the left one for the main features of the app, while the other one for the notifications and features we have just mentioned. Click this link to see the other images for the Android 4.4 Google Play Games design.